A place that has inspired Viennese artists, satisfied wine connoisseurs (Grüner Veltliner land) and a legend of royal loyalty. 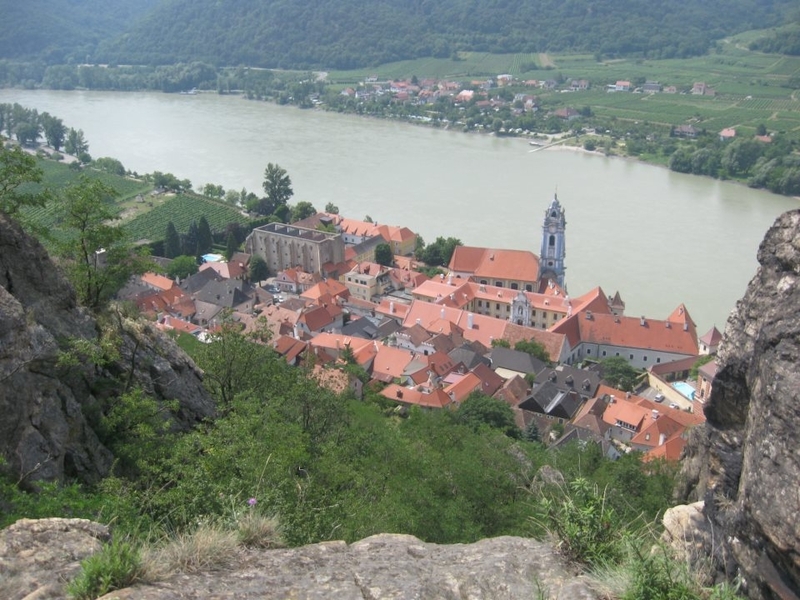 The region here along the Danube in Lower Austria is known as the Wachau (if you are hail from NC, you’ll be familiar with Wachovia, settled by Wachau immigrants). What Naples is to California, so is Wachau to Austria — for lovers of romance, white wine and quaint villages. 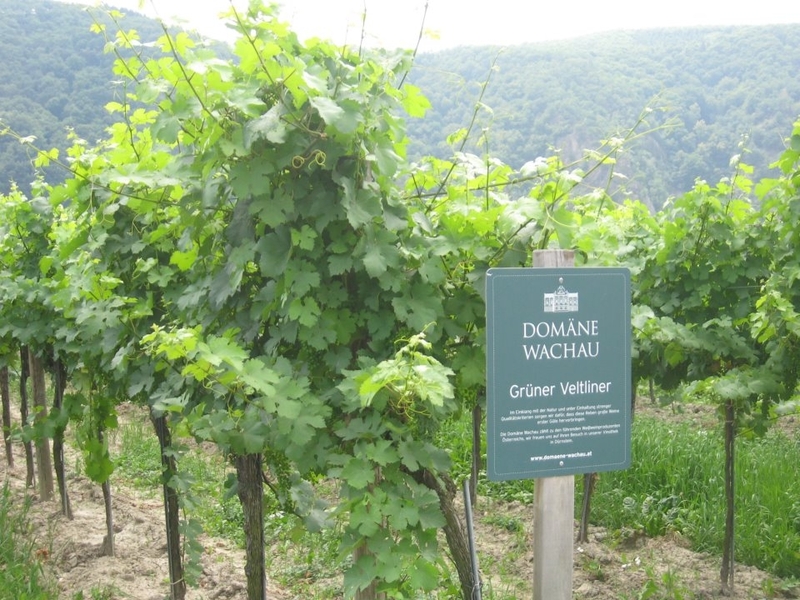 The mild climate and Danube valley location combine to make the Wachau the perfect place to cultivate white wine and that’s exactly what people have been doing here since the time of the Celtics (over 2000 years ago). Due to the hills, vineyards were planted in the form of terraces which you can see particularly well from the boat tour. The walls of these terraces were built without mortar, simply stone-on-stone. The direct train from Vienna to Krems takes an hour. 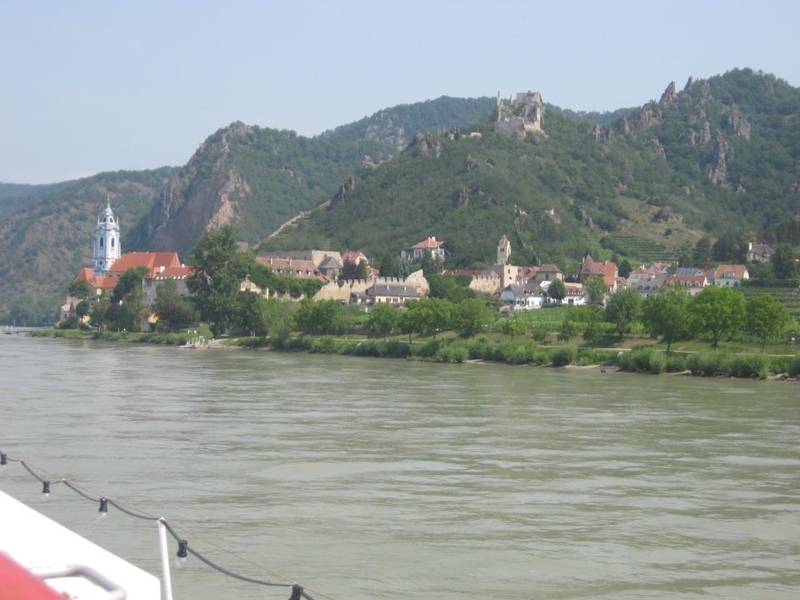 Then you hop on a boat heading down the Danube to the town of Dürnstein, walk a half hour to the castle ruins (read castle tale below), bike through vineyards and along the banks of the Danube back to Krems. Along the way, have a meal (and some Grüner Veltliner) somewhere in the vineyards between Dürnstein and Krems. After arriving back in Krems, take a leisurely stroll through the old town, perhaps enjoy a mega decadent ice cream and then catch the train back to Vienna. A) decide how you will get your bike. You can either rent bikes in Krems and take them on the boat with you (not a problem but you a pay a little fee for this. The advantage is that you are good to go as soon as you are off the boat and return is simple) or you sign up for next bike (also good for Neusiedler outing) to reserve bikes from a bike rake at the port in Dürnstein and return the bike to the bike rake at the port in Krems (there is no one present to help you get the bikes and return them and you reserve them online). Read further for more info on both options. B) Decide if you will take a taxi or walk 30 minutes from the train station in Krems to the boat dock. If you take the taxi, then have your hotel perhaps call a taxi company in Krems (numbers below) and have a taxi waiting for your train. Getting there: Direct train from Vienna to Krems/Donau (!). There is a Krems, Steiermark and you DO NOT want to go there for this trip. So be sure to specify Krems/Donau. The best (most direct) is the regional express train (REX) from Vienna’s Franz Josef Bahnhof. Franz-Josef Bahnhof is easily accessible with the subway (U-4, Station is Friedensbrücke) – it’s about a 5 minute walk from the subway to the train station. There is at least one train every hour (more often on weekdays). The train that leaves 51 minutes after the hour, is direct and arrives about 5 minutes before the next full hour (approx. 1:03 hrs later) in Krems. So if you are spending the day, catch either the 7:51 or the 8:51 am train. At the moment (April 2014), this train leaves from platform 4 and goes directly to Krems (arrival at 8:55 am or 9:54 am). Austrians would take the later train but since you aren’t sure where you are going and still might need to pick up your bike rental and buy boat tickets, maybe opt for the earlier option. The Krems Boat Dock has a lovely little gift shop and a café where you can have a cappuccino along the Danube while waiting to board your boat. If you choose to rent your bike and take it with you on the boat, you might want to consider this bike rental place located near the dock. Have your hotel call ahead and reserve your bikes for the day you need them (or you call or send an email). Next Bike: First register yourself as a user by calling. Then once you reach a bike stand, you call number again, give them the bike number you want and you’ll get a code. You can even reserve bikes if you want to be sure there are ones available when you arrive. https://www.nextbike.at/ausleihen.html?&L=en Just make sure when you return the bikes to the bike stands at the end of your ride that the bikes lock into place or the clock will keep ticking and you will be charged more. (I admit, I did this once!). 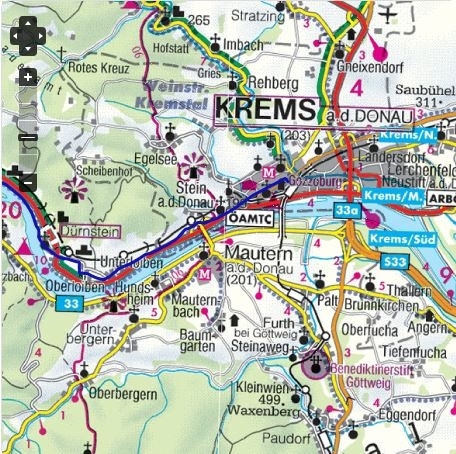 Getting from train station to dock: Once you arrive in Krems: You can either walk from Krems train station to the Krems Dock or take a taxi. The distance is about 3-4 km. The walk will be about 20 – 30 minutes but you have no luggage and are fit, so consider this option. I’ve done it. So can you. But it is not a scenic walk since it follows a sidewalk alongside the road. Alternatively, you can have your hotel call Krems and arrange for a taxi to meet your train. Some Krems taxi numbers: 02723/72121; 02732/1718; 02732/85883. I have never done this but it should work. Boat Tickets: At the dock, buy your ticket to Dürnstein. One way is about 16 € a person. If you have students in your group, ask about discounts. Boats leave daily at 10:15 am, 1:15 pm and 3:45 pm from Pier No 25 (the port is so small, they will direct you when you buy your tickets where to go). The boat cruise to Dürnstein takes exactly 35 minutes. Get a seat on the upper deck and buy yourself a cool drink – a beer or perhaps the Austrian version of 7-Up/Mountain Dew — Almdudler – a drink so irresistible with the dirndlerd lady and lederhosened guy on the bottle. Quaintness all bundled up in one little village — at the foot of the Dürnstein castle. If the town of Dürnstein wasn’t situated here in the Danube river valley, it’d be under someone’s Christmas tree. The main road through town is a cobble-stoned pedestrian zone which will require you to walk your bikes. If you are looking for some souvenirs, here’s a great place. The region is known for its apricots and you can get some high quality apricot Schnaps here that will warm you from the inside out. Visit the “Stiftskirche Maria Himmelfahrt” / Church of Marie Accession (the church with the blue towers) built from 1721 – 1724. The blue color of the towers was rediscovered during restoration work in the 1980s and then adopted once again. Read more about Maria Ascension Church in German. Don’t know German? Admire the pretty pictures. Dürnstein Castle Ruins: Yes. You gotta do this. Walk your bike through the town of Dürnstein and park it somewhere safe (past the cemetery a bit up the trail leading to the castle) so you can walk up to the castle. This isn’t the Bronx, the lock on the bike should suffice. Just don’t block the path; there are bound to be more hikers. Then embark on a short but steep walk. Trust me. It looks far more intimidating than it actually is and is definitely worth the sweat and strain. I’ve schlepped many a visitor up here, and every single one freaks out after about 5 minutes because it’s “so freakin’ steep.” But think of your tightening derriere muscles and once we’re sitting on top of the castle ruins, you’ll thank me. You will exhale, and exclaim, “Wunderschön!” (Austrians at this point will usually pack out a bar of Milka, an Extrawurstsemmel and a can of Gösser or bottle of Römerquelle as a reward for a walk well done — so you might want to do as the natives too). And once you catch your breath, you’ll be taking the photos because it really does look oh so high and adventurous (who needs to know it only took a half hour?). You’ll get a great view of the Danube from up here and realize why the castle is so well-positioned (exactly at the curve of the river) and you also might spot some climbers on the rocks across the way — a favored climbing spot. Why they have made me a prisoner here. Friends had I many but help have I none. To languish here two winters long. In 1192 (yes, 822 years ago(! )), Richard the Lionheart (Richard Coeur de Lion) was making his way back to England from his failed Crusades. Now you know how it goes, sneaking on your way home from a long journey to fight evil and ungodliness and the only route is through a neighbor’s yard who hates you. You could go the long way around and avoid said neighbor or take a short cut. You see, Richard knew he had made a lot of enemies over the years. The French King Philippe Auguste was out to get him. And there was always the pirates to consider. So this nixed the idea of returning to the motherland by sea. But on land were the pesky robbers either out to mug or kidnap him. So he disguised himself as a lowly beggar to avoid capture (or maybe the paparazzi). But life obviously isn’t always greener on the royal side of the fence. Dumb, that the land route lead him through Austria – home of Duke Leopold – the guy Richard had insulted during the siege of Acre by tearing down his flag and telling him to scram. Leopold had a hissy fit and left but lived by the rule that revenge is best served cold. So when Leopold’s troops in Austria discovered and captured Richard, Leopold surely did his happy dance. Richard sure knew how to rub folks the wrong way. But even if Henry IV despised Richard, there was of course all of England to consider, which kinda liked their guy. So Henry IV wasn’t sure what to do with their prisoner either. Do we ransom him to the French? To the British? Just kill the pest and be done with it? I know! Let’s pull a Scarlett O’Hara, and think about that tomorrow. Meanwhile we’ll lock him up in that castle in Dürnstein. The English knew Richard had been captured but who knew where? Spies were sent but 007 didn’t exist yet so they failed, of course. In walks Blondel de Nesle. Blondel knew Richard from their escapades together in the Holy Land. Maybe he was a loyal follower of Richard I. Perhaps a faithful believer. The man could have also been simply crazy, stubborn, lost, bored or longing to have his musical talents discovered by royalty. In any case, Blondel trudged around to all the great castles in Europe playing his flute (“Will you tell that flute guy out there to stuff his pipe! We’re trying to eat our drum sticks and count our gold in peace in here!”). He reached Dürnstein, played his flute and lo and behold, Richard popped his head out the window and started singing along! (OK, maybe not exactly like that). Well, according to legend, Blondel wasted no time getting his king out that very night. According to historical records, a lot of talking heads got together, had coffee and donuts, wine and drum sticks, and when topics for small talk dwindled, the English were able to secure Lionheart’s release. 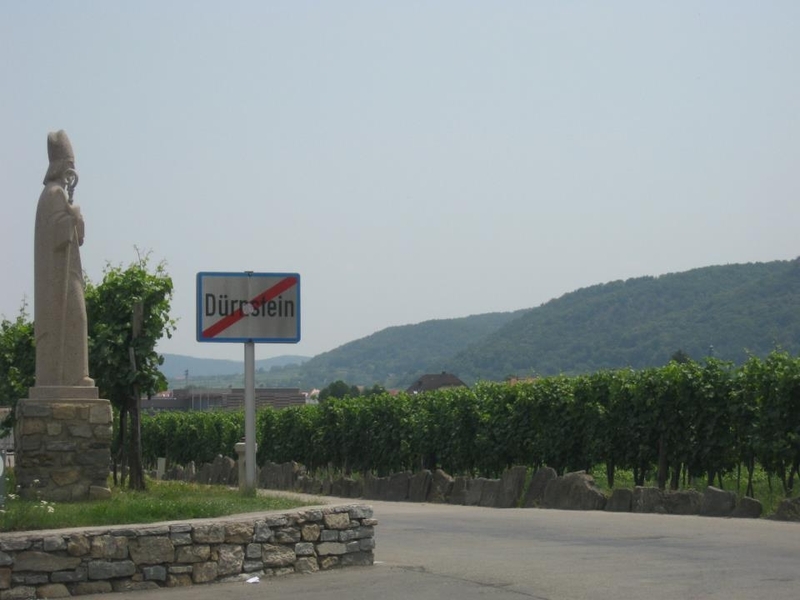 Exit Dürnstein town and bike through the vineyards of the Danube valley. Be sure to stop at one of the restaurants in the vineyards for some wine and lunch or lunch and wine, whichever you prefer and your biking skills can handle. If you see a vine hanging over a door, it means they are serving this year’s wine and probably food as well. A menu placed outside is another good indicator. Be adventurous and definitely aim for a place in the middle of the vineyards. 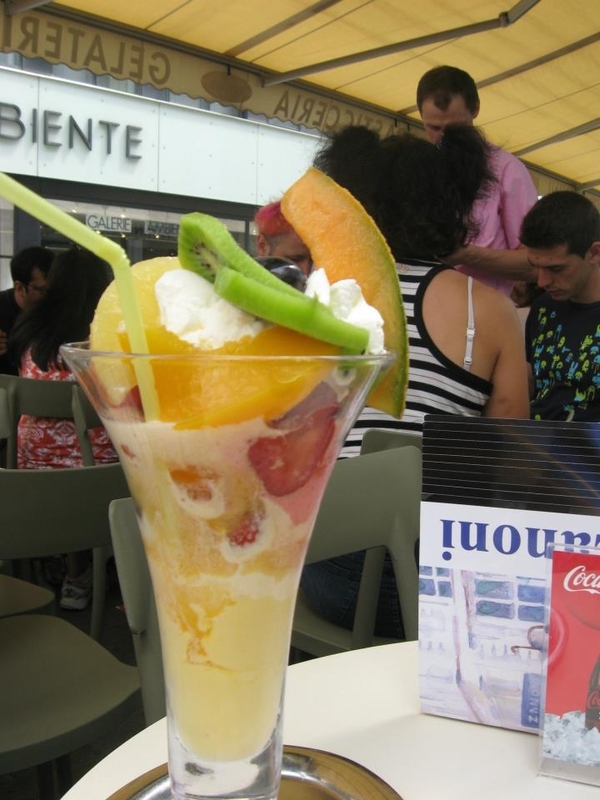 Once you have sufficiently eaten and quenched your thirst, continue your tour. Bike onward to Unterloiben and get a great view of the Göttweig Monastery across the water up on the hill. Then you reach the town of Stein which inspired some of Egon Schiele’s most beautiful paintings. Here you can go through the Linzer Gate to the cobblestone lane of Steiner Landstrasse, straight ahead. Onward to Schillerstrasse, then veer left to the Wichner Strasse to Südtiroler Platz (square) and the Steiner Gate. On the other side of the Steiner gate, the pedestrian zone for the Old Town of Krems begins. You might want to return your bikes to the dock, though, before doing a walk through town. Direct trains from Krems back to Vienna are usually hourly and generally leave about 2 minutes after the hour and take 1:02 hours. Back in Vienna, sit back, prop your feet up, admire your cell phone photos, pour yourself a glass of Veltliner and drop me a line about your adventure.